In the early morning hours of Thursday, Oct. 5, 2017, 47-year-old Tracy Hawes was walking through Downtown's Pendery Alley, which stretches between Race and Vine streets, just north of Ninth Street. They were the last steps she would take. After neighbors and nearby police officers heard her screaming for help, they found her lying dead in the alleyway before they could intervene. Police ruled the case a homicide. CINCINNATI -- Tracy Hawes' death in Pendery Alley is the latest chapter in a pervasive narrative surrounding the city's more than 500 urban alleys and stairways : that they're dark, dirty, and dangerous. In other words, they are the cracks in the urban landscape where things fall unwanted or forgotten. But there's a growing movement to change that perception and return these spaces to their original purpose. "These are alternate routes through these densely developed areas, geared and designed for the pedestrian," Christian Huelsman said. Huelsman heads up Spring in Our Steps , a local nonprofit dedicated to cleaning and maintaining the city's alleys and steps. He and his modest team of volunteers are on a mission to change that public perception, one brick and cobblestone at a time. Witnesses to Hawes' death said they heard a woman screaming from the alley around 1 a.m. that Thursday. "I couldn't identify where those sounds were coming from," nearby resident Rick Dieringer told WCPO the day of the attack. "I didn't see anything out my window." Witnesses describe scene after alleyway killing. He said he's used to commotion coming from the alley at all hours of the night, and he usually investigates. "I wish I had gotten dressed this time and come down. I may have been able to save her life," he said. Huelsman was also the victim of a crime near an alleyway, when he was robbed in the backyard of his Clifton Heights home in 2011. That experience sparked the genesis of what would become Spring in Our Steps. "It was striking to me to see these public spaces no one was advocating for," he said. "Generationally, we've relegated these areas as throw-away spaces. People recognize them as a public space that's not being maintained." Incidents like these, Huelsman said, have established a deeply rooted, poor public perception of alleys and public stairways over the decades. They've become perceived as common backdrops for drug deals, overdoses, stabbings, shootings and other derelict activity. And if none of those things, they can often become clogged with trash cans, dumpsters and garbage or delivery trucks. Not to mention the weeds, creeping up through the cracks in the historic brick pavement on a mission to make it disappear forever. "Their state creates a distrust with city departments, with the city as a whole, in its ability to maintain what they have," Huelsman said. Other times, damage to the original pavement left after utility work threatens the integrity of the brick streets. Former Newport, Ky. mayor, now developer Tom Guidugli Sr. experienced this firsthand with one of his first affordable housing projects in the city's East Row Historic District. He recently completed a rehab project on brick-paved Weingartner Place through his development group Neighborhood Foundations -- which formerly operated as the Newport Housing Authority. 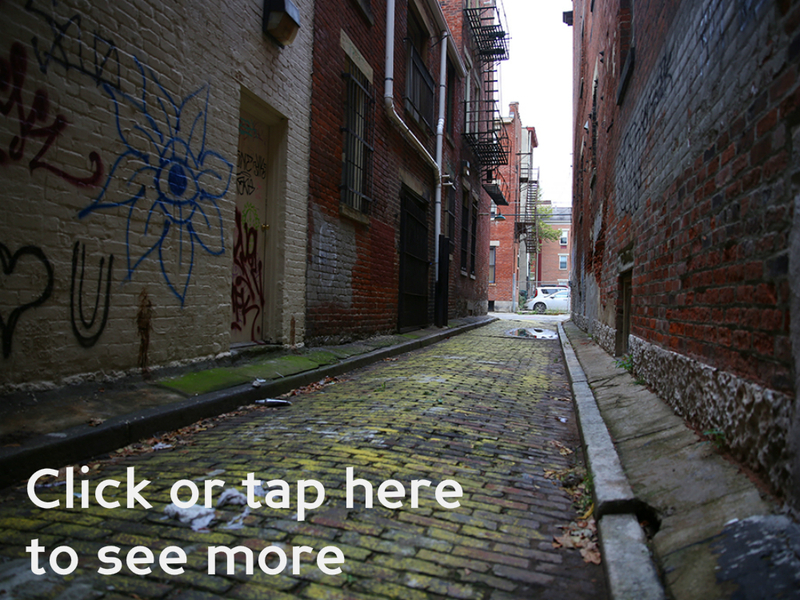 If you looked at it, you'd probably think this street is just an alley -- and, until recently, a rundown one, at that. Guidugli worried he wouldn't be able to sell the property with such a dilapidated roadway leading to its front door. "It really looked bad," he said. "I said to myself, 'I'm going to get that fixed.'" Guidugli received one of 2017's River Cities Excellence in Preservation Awards -- handed out annually by the Kentucky Heritage Council -- for his work on Weingartner Place's brick work. He also has rehabilitation plans -- both on more properties and nearby brick- and cobblestone-paved streets and alleys -- already in the works. Sometimes these spaces become so overgrown or overrun with litter that people begin to doubt whether it's a public space at all. "Before you might have seen a set of steps that go down there but then be like, is that private property? Am I allowed to go down there?" said Huelsman's fellow Spring in Our Steps board member, John Stork. 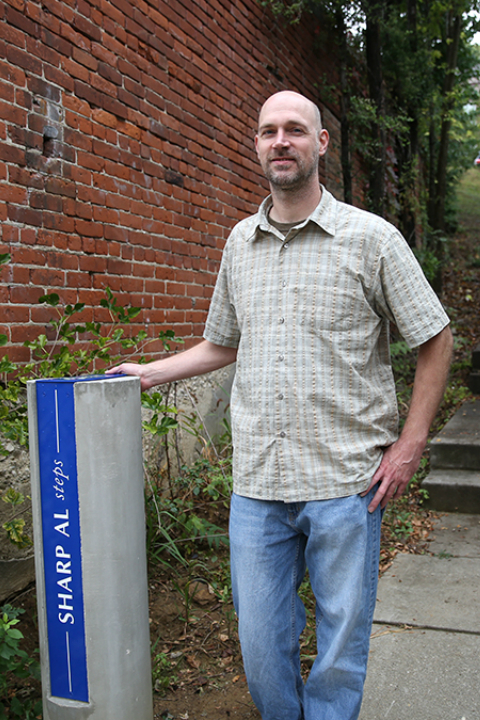 Stork said it's the diminishing awareness that these alleys and stairways are public spaces that prompted Spring in Our Steps to install "gateway signs" at strategic points throughout certain neighborhoods. "If you have a formal thing that identifies them as public rights-of-way, then it encourages people to use them more," he said. "Rather than each neighborhood being a silo, this helps with circulation through the neighborhoods." Huelsman characterized the signs as a sort of on-the-ground GPS system for pedestrians. "These signs are meant to bring guidance for someone who is walking through these neighborhoods," he said. "'Gateway' is just something to signify that you're moving into a new community." In addition to the gateway signs, the majority of Spring in Our Steps' work entails clean-up: that is, removing overgrowth, pulling weeds, picking up litter and fresh coats of paint. Ultimately, Huelsman said the alleyways and stairways are crucial to connecting neighborhoods beyond motor-vehicular means. "Gateways, lighting -- they're often scaled for vehicular traffic," Huelsman said. "These alleys and stairways... have always been scaled to the pedestrian." 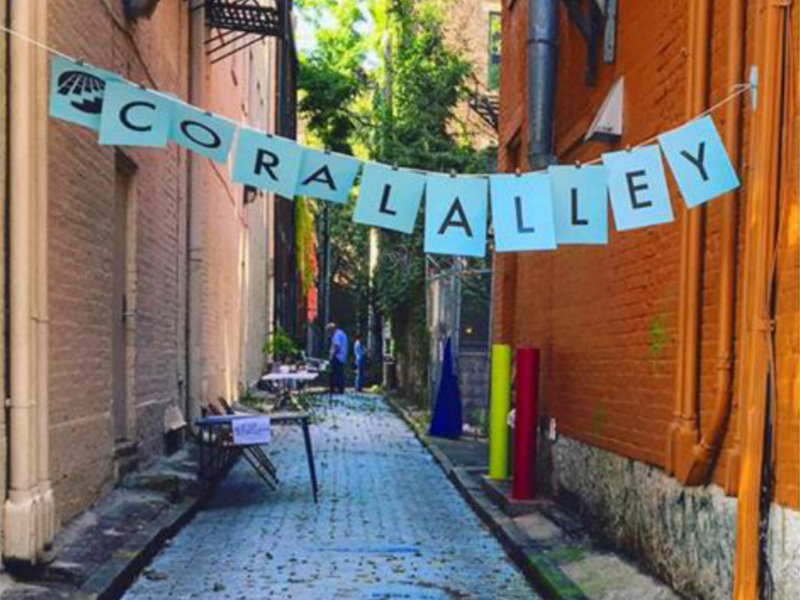 The clean-up of Over-the-Rhine's Drum and Coral alleys -- situated between Main, Clay and 13th streets -- drew Spring in Our Steps volunteer Abby Erwin's attention to the movement. "I had walked by numerous times with my dog, taken pictures with my dog -- just because the alleys look so neat," she said. It didn't take long before she was volunteering. "We set up an event on Second Sunday on Main, with photography, ceramics, music, singers, Gia and the Blooms (flower delivery), to invite people into the alleyways at Coral and Drum," she said. That event took place in September. The event was staged overtop freshly painted bricks and after hours of clearing litter and glass bottle debris. Previously, the brick in the adjoining alleyways had been vandalized with paint, so organizers embraced it and ended up painting over all the brick. They also fenced off the northern half of Coral Alley, as they were experiencing trouble gaining the cooperation of those property owners. "We wanted people to feel invited into the alleys," she said. Maintaining that inviting feeling is literally a never-ending job, and these efforts aren't always a permanent fix. 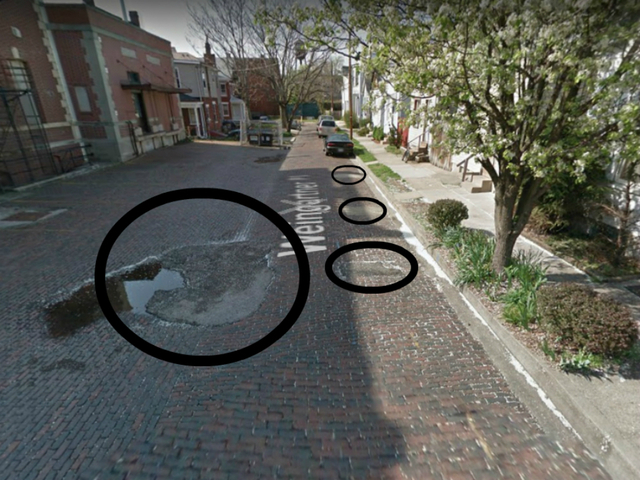 Despite both Cincinnati and Newport having legislation requiring brick alleys and streets be restored rather than repaved, it doesn't always happen that way. Sometimes preservation and restoration efforts can become undone. "(Utility providers) don't necessarily think about what they're digging into," Guidugli said. "They're there to restore the service that's interrupted as quickly as possible. People want their power back or their sewer fixed quickly." "When we see community ownership, then we see a means to retake these spaces for community use." This often results in concrete patches peppered across the brick surface. Because cities' preservation offices and organizations like Spring in Our Steps are not alerted to each and every instance a utility needs to dig, it becomes almost impossible to keep up. "You can't be everywhere all at once," Guidugli said. Instead, preservationists rely on community and grassroots input to identify spots that need to be addressed. "You have to have pride in your community," Guidugli said. "This relies on that." Huelsman takes a similar approach: "When we see community ownership, then we see a means to retake these spaces for community use." Beyond what their clean-up and restoration work has done for connectivity and walkability between these neighborhoods, these alleys and stairways remain these cities' window into their long and rich histories and architecture. "We can only envy how these spaces were engineered," Huelsman said. For Erwin, who has found herself photographing alleys and stairways more and more, each one tells its own unique story. "What I like about these alleys and stairways is they're very unique, and they're old. It's not something that you see every day walking around," she said. "They all have a unique feature to them, and even with the community of people that live by these alleys and stairways, and how they make their mark, it's just cool to see... how people interact with them." Because they're so often hidden from the public eye, she said, these restorations projects represent the revitalization Cincinnati and the Tri-State at large has been seeing in recent years. "Just the fact that they're hidden and recently discovered, because Cincinnati is definitely booming," she said. "Like with the stairways and alleyways, it's being rediscovered. It's exciting, being able to say that you know of this space that not many people know... yet." Pat LaFleur reports on transportation and mobility for WCPO. This story is part of WCPO's focus on highlighting alternative transportation and moving beyond the automobile throughout the Tri-State.